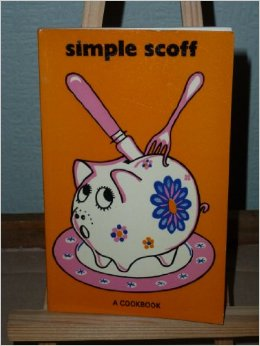 In 1972 the Warwick Student Union published a cookbook called Simple Scoff. It consisted of recipes submitted by students, along with a few contributions from academic staff and members of the university administration. The wife of the Vice Chancellor, Doris Butterworth, wrote a prologue and also contributed a recipe for paella. Other notable recipes include ‘Spaghetti a la Stoneleigh’, ‘Vegetable Splodge’ and a flow-chart explaining how to cook potatoes in a pressure cooker. Warwick’s 50th anniversary is a perfect occasion to publish a new edition. To do this, we need recipes! These can be extremely simple, or as complex as you like—the cookbook should reflect what today’s Warwick community actually cooks. If you would like to contribute a recipe (or many recipes . . .) please either use the online form, or upload a document. One of the charms of Simple Scoff is that each recipe listed the name of the person who contributed it, along with their department or other affiliation. Some recipes also included introductory commentary about the appropriate circumstances for eating the dish, or particular points of interest, etc. Please do add any such introductory comment in the box below, if you would like.